"My thoughts were forming but I couldn't speak the words," she recalls, and adds"I knew I needed to get help quickly." Wolfe's experience is all too common. 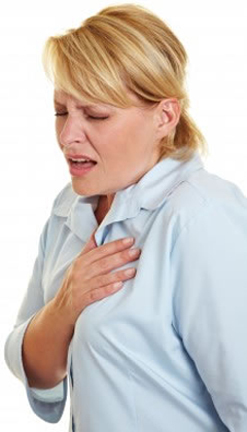 Every 40 seconds someone in the world has a stroke, according to the National Stroke Association of the USA. And women are the ones most often affected. In fact, strokes kill twice as many women each year as breast cancer does. "Because we knew the signs I got immediate treatment," Wolfe says. "I survived and just last weekend I stood watching proudly as my daughter graduated from college." Wolfe not only survived, but also went back to her old life coaching girls' softball. "I knew they needed me and I wasn't going to let [the stroke] set me back," she said. "I had to come back strong. I had to show people that even when you have a stroke you go on with your life." Doctors say more people would survive strokes if we all recognized the symptoms. 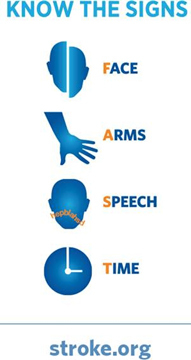 The 'S' is for speech: a person having a stroke often can't come up with words or will say the wrong ones. The 'T' is for time: a reminder that time is of the essence. Time is extraordinarily important for survival and recovery, says neurologist Dr. Carolyn Brockington, Director of the stroke centre at Mount Sinai Roosevelt Hospital in New York. "As we like to say, 'time is brain,' and every moment that goes by with the brain not getting enough blood flow and there's the potential for significant injury," Brockington says. "So we want people to act fast. Everybody googles symptoms or calls a friend, but what you really want to do is call 911 and get to the closest hospital as quickly as possible." Strokes don't just strike the middle aged and elderly. "It can happen at any age so everyone should know the signs and symptoms of stroke and what to do about it," says Brockington.At 28 Carolyn Roth thought she was healthy. But one day at the gym she developed an excruciating headache. "I thought I injured my neck," she recalls. "Assuming I pulled a muscle, I took some pain killers. "On the drive home from the gym she had some perplexing experiences. "I started to have these visualizations," she says. "I thought there was water on my phone, that there were diamonds in the road. But it still didn't make me think that there was something wrong." That was two days before her sister's wedding. The night before the wedding, as she was lying in bed next to her sister, Roth had a stroke. "I never made it to her wedding," Roth says. "She's crying in many of her wedding pictures and my brother had to take over and make the maid-of-honour speech.A single woman, Roth leaned on her family to help her through the experience. "I was determined to come back strong and ran in the New York City Marathon as a survivor," she says, adding "And last September I walked down the aisle at my own beautiful wedding."